I Card Everyone : Fusion is celebrating 3 years! Fusion is celebrating 3 years! Happiest New Year to you all! I'm keeping the celebration going at the invitation of Karren Johnson, aren't I the lucky one who gets to celebrate the 3rd anniversary with Fusion?! Oh YOU get to play along, and celebrate, too!! Hmmm? What did I find in my arsenal of goodness to represent this darling little Wintery scene? Oh don't think for a moment I was done with that Pine Bough embossing folder! For me, a true Fusion - the photo & the Sketch! Thank you, Karren for the invitation, and congratulations to your fabulous Fusion challenge, and awesome team! Cheers to the next 3 years! Looks fantastic, Michele! I like how you added the bits of blue behind the embossing. Adds such great interest. Your red and blue decanter and cups are fabulous. What a great sentiment, too. Wonderful fusion! Hugs! Love that touch of blue on your embossed background, makes those boughs stand out just a touch more. Your new set was perfect for this challenge! Well done. I've been admiring this card since you sent me the photo, Michele! It has so much interest yet is still so beautifully CAS. And that background? Swoon! Thanks so much for taking the time to join us over at Fusion. Wow......perfect scene of coffee in the pines! Love everything about this little gem! perfectly perfect! So fun to be playing along with you! I'd say you captured the photo perfectly, Michele. Watercoloring between the embossed pines adds so much dimension to the background and adding the 'tray' was inspired. SO wonderful that you're playing along with this amazing group! 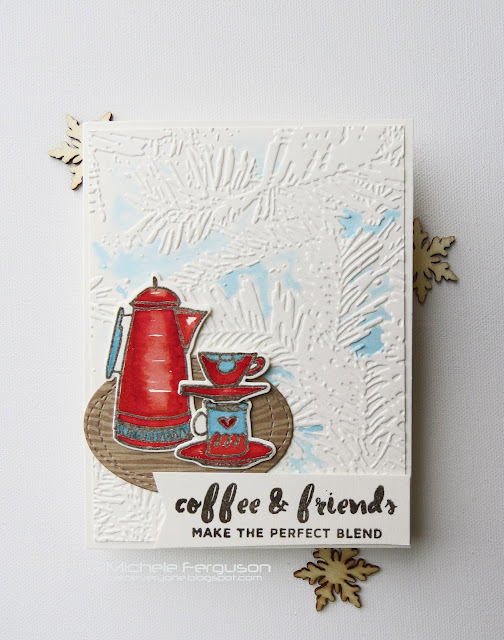 Love, LOVE the beautiful embossing, the lovely blue/red combo and the fantastic Coffee Love stamps! Congrats on your GD spot, Michele! I love how you added a touch of color peeking through those beautiful pine boughs...both elements add so much depth and dimension to your design, and your 'place setting' makes me wish we lived closer so we could enjoy the real thing! Another really lovely card, my friend! Coffee and friends do, indeed, make the perfect blend, and one of these days I'm going to have coffee with you in real life! Marveling over your arrangement of fabulous images...coffee pot and mugs, the pine embossing, the spotlight water-colouring....perfect harmony! Love! Stunning card Michele and the perfect take on the inspiration! It's hard to feel the chill right here with the Summer type high temps going on lol. What.... three years already! Well, congratulations to you and them for having you! Loving that bit of watercolor on the embossed background! This is one darling cozy card! 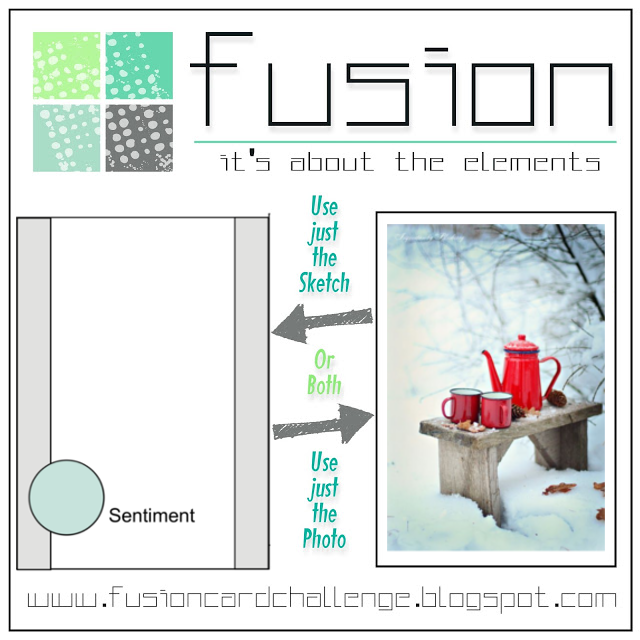 Essentials by Ellen - Pin-Sights Challenge! Mix it Up Challenge - Second helpings!